This interview was conducted by Official PlayStation Magazine. As mental illness awareness starts to improve, games ￼￼are starting to explore the topic in meaningful ways. None, however, is quite as thorough and ambitious as Ninja Theory’s complex depiction. 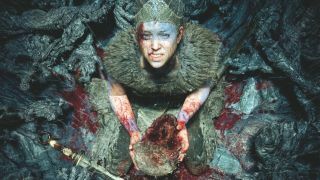 Hellblade’s protagonist, Senua, is journeying through ‘Hel’, but she (and you) will experience the world through the lens of her psychosis. OPM: How did you first become involved with Ninja Theory and Hellblade? Paul Fletcher: About 18 months ago, Ninja Theory emailed me and said that they were making a game in which the central character had a psychotic mental illness and would I be interested in giving them some advice on this as a clinician. I was initially a bit sceptical because I hadn’t actually heard of Ninja Theory and I was aware that computer games weren’t terribly sensitive in handling mental illness. But I came along, met with [producer] Dom and Tameem and it was very clear in a short space of time that they were serious about working sensitively and in an informed way. For a long time I’ve thought that computer games have a great deal to offer our understanding of how we process the world, so I was hooked from an early stage. OPM: What does working closely with the team at Ninja Theory offer you? PF: A lot of things really. I mean, firstly, I think it’s been incredibly interesting to see how very talented people represent things that I’ve only really experienced through talking to patients or reading about in textbooks. For example, there are a series of really nice first-person accounts of the early stages of becoming psychotic that you can get in these obscure psychiatry papers in the 1960s. Well, the team here have been able to turn a number of those things into actual experiences you can see on screen and into things that you can hear through headphones, and I think that’s amazing really. Also, through discussions with people who’ve suffered mental illness, they’ve been able to turn their experiences into a representation, so that’s incredibly rewarding. On top of that, they’ve provided material and content that I’ve been able to use in my lectures to medical students and the public so it’s already feeding back into educating and helping people. PF: My previous experience with helping with projects, I’ve never done it with games, but with documentaries and things, is sometimes the feeling that you become the arbiter of what they can and can’t say and what they should and shouldn’t do. That can be helpful, but it’s not that stimulating and engaging. But in this case it really wasn’t that, it was more of a sort of general discussion of the brain, the world, how it makes things up, how we’re all much closer to psychosis than we’d like to think, and how you could incorporate them in the story. OPM: How does the idea that we’re closer to psychosis than we’d like to think translate into a video game? PF: What’s really interesting about the brain is that essentially it has very little direct contact with the world around it. It has these binary inputs from the senses, but those are just sort of short, sharp messages about what might be out there and somehow the brain has to assemble that into an inner picture of the world. We don’t actually have the world painted onto us or onto our minds, we have to assemble it, so a lot of what we’re doing is building rather than perceiving. For me it’s very challenging to try and do experiments on that, but video games are the perfect setting because you’re placed into an environment that you have to make sense of. What even the healthiest people do is miss out a lot of stuff that’s actually there, they warp things to fit with their expectations, they build a world that fits their expectations, and in that sense I think we’re closer to hallucinations than we think. Much of what’s going on around you, that you feel you’re perceiving clearly, is actually your brain filling in the gaps. OPM: What moments in the game do you think represent these ideas well? PF: Well I haven’t seen the whole game, but from what I’ve seen time and again I’ve thought, for example, the binaural voices as representations of auditory hallucinations, that I think is stunning because it brings things just right to the fore. You can see the reaction among students when you play that, they’re suddenly engaged with the idea of what hallucinations are, they’re not just verbally describing what somebody heard. Something like that I think is amazing. On top of that there are all sorts of concepts, quite complex concepts that we use in our neuroscience experiments about how the brain picks up patterns and how different manipulations can mislead it. To see that represented in a game in a number of ways is really exciting. For example, there are all these experiments from the ’80s and ’90s by various behavioural neuroscientists showing that if we’re making movements and somehow there’s a bias introduced, it deviates our movement from what we think it is. We’re actually relatively insensitive to that and we just assume that that was the movement we intended in the first place. That idea tells you an awful lot about how we control movement, so that’s been incorporated into the game, and there are several ideas like that. I think it’s just fascinating to take those ideas that are quite dry and bland and put them into a user’s experience as they’re playing the game, or a player’s experience. Tameem Antoniades: There are some more specific examples, like playing with the idea of association with the trees swaying based on the [player’s] movements. This was Paul telling us that often people with psychosis see agency in the branches of the trees, so the things that we see naturally moving in the wind, they would see as moving of their own free will. PF: I forgot to mention that, that’s a really good point because what’s often represented here is the really early stages of perceptual change that occur in psychosis. One of those is this feeling that things are somehow more important, they seem more important than they would do normally. The fact that you nodded would seem a bit laden with meaning and significance to me rather than you just being polite. There are a number of instances where, as Tameem says, that’s put into the game, in ways that don’t necessarily have meaning for how to play, but they’re just there and they create that sense of a really strange and slightly sinister world. OPM: It sounds like how a critic analyses a scene, constantly looking in the environment for meaning. PF: One of the big, quite influential theories of psychosis is that you get this abnormal salience. Something perfectly ordinary seems to be part of a puzzle, something that you have to think about and work out. I always think of Casualty, the opening scene is always something fairly innocuous, such as someone screwing in a light bulb, but because it’s Casualty that this is going to go badly wrong and I think it might be a bit like that, continually everything that happens you think, what did that mean, where is it going to fit in? In films they call it [Chekhov’s Gun]. TA: When you’re playing the game there’s two things that we do that films rarely do. One, there are no cuts in the camera, it’s one continuous shot from start to finish, and the reason that’s done is so that you don’t feel like there’s an editor in the way, you just feel like you’re an observer the whole way through. The other is there’s very little music, there’s not a soundtrack that accompanies things, and if there is music it’s almost like a memory, it’s almost like an echo. Most of the soundscape, there’s a lot of sound, there’s a lot of sound accompaniment, but it’s more like an internal soundscape than a composer has gone in and scored a film. In a way everything you see is what she’s seeing as well, although it’s not first-person, it’s a slightly disassociated perspective, but the camera doesn’t fly away from you and show you what’s around the corner, you only see what she’s aware of. OPM: Did you feel working with Paul helped you, as creators, to get a different perspective on things? TA: Massively. I mean a similar thing has happened before, like when we worked on Heavenly Sword we were collaborating with Andy Serkis, so from that we learned a lot about working with actors on set and film crews and it opened up a whole different world for us. I think this is comparable, working with Paul and other experts. It’s opened up a different way of thinking about the world. In fact it’s sort of changed my whole perspective of life in a way, it’s that fundamental, because I thought that I was just wandering around an objective world receiving information and I saw the world as it is and now I realise that everything I see is in fact my brain projecting. I realise that we’re living in a Matrix, but it’s not a computer simulation, it’s just my own brain creating a Matrix. Everything I believe I question, everything everyone else believes I also question. It’s fundamentally shifted my perception of reality. Things that were a total mystery to me make sense, like dreams, these hallucinations, and the answer seems to be obvious now with the evidence that we’re in a constant state of hallucination and without those tiny sensory inputs to anchor it, you just dream. I think that’s where creativity and imagination comes from, I think that there’s a reason why our brains work that way and it’s for the survival of the species, and in extremisms we draw a line and we call it mental illness. It’s just put a lot of pieces together for me, so, yeah, that goes well beyond Hellblade.